As we get older, we tend to appreciate things we took for granted, like stories from grandparents about their life and the childhood of our parents. Family stories may be boring when we’re kids or when they’re repeated often, as can be the case when our parents enter their 80’s, but grandparents and parents who pass on their stories help children remember their heritage, their family strengths, and joyful times. During the depression, if we received oranges and candy that was a great treat. One Christmas Eve morning the firemen came to my barrio of Little Silao, in Pomona (CA). This Christmas was special, it was 1932 and the middle of the Great Depression. FDR was the president. Times were hard, but my family was lucky. My mother had a vegetable garden, and walnut trees in the backyard, rabbits and chickens too. We had enough to eat, barely enough for clothing, and no money for toys. I was four and wanted a doll more than anything. We didn’t have a Christmas tree that year, but we did have a little table in the living room which mama decorated for the arrival of baby Jesus. She bent tree branches to form a small tent and added little green fans of pine over the branches to form a shelter. Tiny pinecones and red berries decorated the sides, pine needles were scattered at the entrance. An empty wooden manger sat in front of this small cave among the boughs. This looked very pretty and it smelled good too, fresh and woodsy. I scanned the street in front of my house while perched on the wooden chair against the living room window. A shiny red fire truck turned into Newman Street, my street. Firemen, in their uniforms, rode on the running boards of the truck. They stopped five houses away from our place. One of them climbed up to the top of the truck and handed blue, gold, and red boxes to another fireman and he handed them to another one who stood on the sidewalk. “Here they come, here they come! Papá, mamá, Catarino, Jose, Concha, they’re coming.” I almost fell off the rickety chair. I had to tell the others about the firemen and the Christmas gifts. I ran from room to room shouting their arrival. My brothers and sister ran out of the bedroom, my mother with baby Adela walked out of the kitchen. She didn’t like me yelling and told me to sit down. Catarino was the oldest at 10 years, Jose was eight, Concha six, and the baby was one-year-old. Everyone sat down, except me. I ran back to my chair at the window. “Here they come!” I shrieked and ran out the front door onto the sidewalk and everyone followed. Maybe I would get a ball and jacks, real ones. Concha and I were tired of playing jacks with washed apricot pits and an old rubber ball. Maybe I’d get a real doll, one of my very own. That would be better than the paper dolls I cut out from the Sears Catalogue. Catarina? That’s a girls name. My brother was “Catarino.” He unwrapped the box and his smile disappeared. It was a doll! He held up the box to give it back to the fireman, but I ran towards him shouting “I want it, I want it.” I got to it before Concha did and ran back into my house. The doll had on a beautiful red dress with black shoes and fluffy hair. I was so happy, I carried my doll the way mamá carried baby Adela. For the life of me, I can’t remember if Catarino took the present meant for me or if the firemen gave him another gift. All I remember was that beautiful doll. Now remember to share your family holiday stories with your kids and encourage your parents or grandparents to talk about Christmases past so you keep your family narrative strong and alive. Merry Christmas and happy holidays to all of you and yours. It’s tamale making time. The season is just like Christmas. You look forward to the joyful day with some trepidation. Why? Because of the time it takes for planning, buying, wrapping, steaming. See, just like Christmas. 1. How many pounds of masa do we need? We did 35 pounds last year, not enough. Yeah, not enough green tamales, let’s make more of those, and less of the red pork. No, more red, less green. Let’s do chicken ones. NO, stay traditional. How about sweet? Hmmmh, we stink at making sweet, let’s buy those. We need a vegan recipe (for the vegan son). Forget that, do those on your own. Okay, okay, let’s get back to how many pounds of masa. 2. We decide on 40 pounds: 10 lbs. red pork, 20 lbs. green chile, and 10 lbs. of chicken with tomatillo (mom makes a disgusting face like she’s throwing up-she hates chicken). Phone rings. Add 5 more lbs for nephew who can’t join us but will pay for additional tamales. Use pork shoulder, lean but not too much. How many dozens does 40 lbs. make again? Geez, this year someone write that down, please. 3. Where are we buying the masa preparada? L.C’s is $1.79, forget that, it’s masa not dark chocolate. But it’s smooth and covers the ojas so well. No, last time there was a fight in the line, ‘stas loca. Women rolling on the floor for a bag of masa. P.V’s is $1.19. Heck no, it’s crowded 24/7 and we have to masarle (knead lard into it). What about your neighbor with the bakery? Okay bro, that’s your job. 4. Who’s making the chile? You? Maybe next year. Ancho? Poblano? New Mexican? Okay, Ancho. 5. How many can’s of green chile’s, how many pounds of Monterey Jack cheese? Buy the shredded one, not the 5 lb blocks. Who cares if they cost a little more, if you buy blocks you’re shredding the stuff. 6. Olives, no olives? Some olives, yes, some. 7. Ojas from P.V’s? They’re a good price but the cornsilk is still on them and some are too little, we got to piece them all together and stuff. Winco in Fresno has ‘pre-soaked’ ojas? No me dijas. And they’re big and pretty? Yeah, they’re all evenly cut and no cornsilk, soak for 10 minutes. Really? Buy us those. 8. We’re starting at 9 in the morning because that means 10. Make sure everyone does the prep work before we get together (8 pairs of eyes shift to the one who insists on buying cheese in a giant block). 9. What kind of munchies? 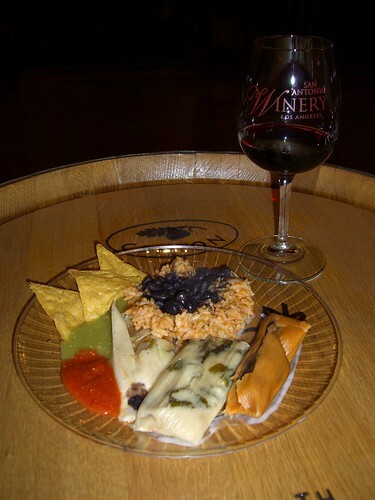 The baked Brie at Costco is the bomb, would go well with Ramos Torres Vino Tinto. Bring a Cabernet, don’t forget white for mom. Somebody better bring salad too. Who’s bringing the See’s Nuts and Chews and Peanut Brittle? We gotta eat, those tamales take three hours to cook. We need to put the first batch in the tina (see above photo) by noontime, 1 o’clock by the latest. Remember, everyone over the age of 5 spreads. No work, no eat. 10. Redo all of the above two more times before December 15th. The conversation is exhausting. Imagine the shopping and set up. On the appointed day we suit up in our various aprons and lay out the various utensils we use to spread the masa on the ojas. We inevitably have the argument of butter knife versus spoon as the best utensil for a smooth application, who spreads the best, who’s taking too many breaks along with the family gossip and remembrances of previous years of tamale making. Someone starts a pot of beans and throws in onion and a jalapeno for flavor. We spread, fill, fold, and stack at least four tamale pots. After the first batch is done, we unroll, sample, and decide if they need to steam longer or not.Time to make some Mexican rice to go with the meal. The kitchen is filled with the earthy smells of nixtamal corn, spicy chile, garlic and roasted chicken. We’re done with eating salad, brie, and crackers. 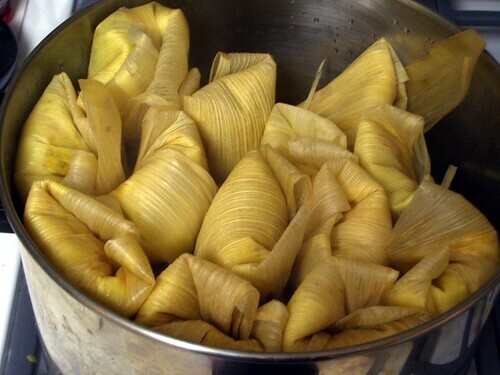 Few things are a better sight to see than steaming tamales unrolling onto a plate with just the right amount of pork in red ancho sauce enclosed with a layer of masa that is not too thin and not too thick. They go well with Tempranillo, Malbec, or Vino Tinto. 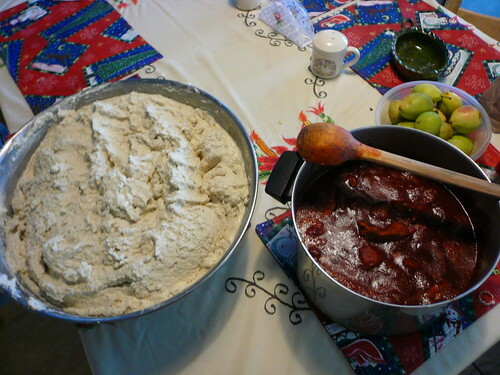 After a couple of pots of tamales are ready, we sit down with throbbing feet, red sauce stained aprons and sore backs. We fill our plates and wine glasses too. We count our blessings, say a prayer and dig in. Hard work, but like Christmas Day, it is so worth it.